KTX Fitness - these Atlanta-based fitness centers are led by Keith Thompson whose trademark is cycling to urban and hip-hop music. The centers also offer boot camps, step classes and total body workouts. Their classes also travel to places like D.C., NY, Cincinnati, and Toronto. Mr. Shut Up and Train - Rahman Grayson leads this Atlanta-based fitness program that offers free workout plans. Grayson offers fitness challenges as well as personal training services that are designed to push people out of their comfort zones in order to accomplish their fitness goals. Black Girls Run - launched in 2009 by Toni Carey and Ashley Hicks, Black Girls Run now has 69 running groups in 30 states across the United States. 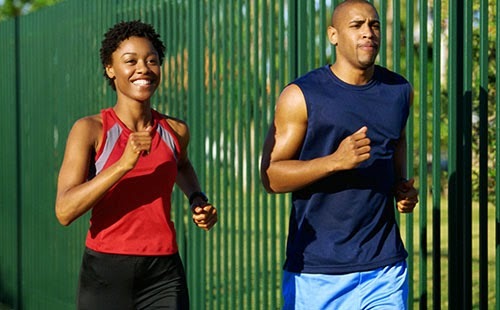 Their goal is to help African Americans fight obesity and stay fit. Brukwine - this fitness company, founded by dancers Tavia and Tamara, combines a very rigorous routine of dancing and workout. For those who want to learn Caribbean dance as a way to stay fit (Rihanna, Beyonce, Jennifer Lopez like it! ), classes are currently being held in New York. Shaun T - is one of the most popular fitness gurus. His fitness infomercials include Insanity, T25, Hip Hop Abs, and Rockin’ Body, and he has sold 10 million DVDs. He tailors his workouts to fit every one's style and makes it fun, too. Black Men Run - helps black men fight against cardiovascular disease and stroke by scheduling running/jogging events in cities across the U.S. The organization started in 2009 to develop a healthy brotherhood for African American men. JJ Smith - is a popular nutritionist, certified weight-loss expert, and author who shares advice about losing weight and getting healthy. She has appeared on shows such as The Steve Harvey Morning Show, The Montel Williams Show, The Jamie Foxx Show, and The Michael Baisden Show and has been featured in magazines such as Glamour, Essence, Heart and Soul, and Ladies Home Journal.